Yale lecturer of mathematics James S. Rolf received an Association of American Universities (AAU) STEM Education Network Mini-Grant on Tuesday to fund specific initiatives that focus on current undergraduate STEM education innovation efforts at Yale and other institutions. Rolf worked in partnership with Jennifer Frederick, Executive Director of the Center for Teaching and Learning, Pamela Schirmeister, Senior Associate Dean of Undergraduate Education, and Carl Hashimoto, Assistant Dean of Quantitative Reasoning and Science Education, to submit a proposal to the AAU in December 2016. Yale is one of twelve AAU member campuses to receive a STEM Education Network Mini-Grant, a $10,000 award per year for the next two years. Yale’s Center for Teaching and Learning and the Yale College Dean’s Office will match the funding with an additional $26,000. 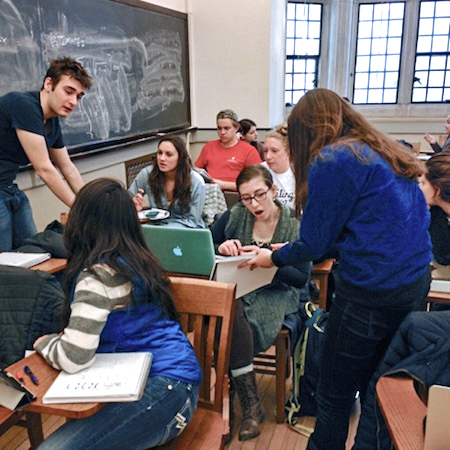 Rolf, the Shizuo Kakutani Lecturer of Mathematics at Yale, has illustrated his dedication to teaching excellence by spearheading the ONEXYS program and experimenting with a flipped classroom for Math 115. Rolf joined the Yale faculty in July 2012 after teaching at the United States Air Force Academy and the United States Military Academy at West Point. ONEXYS, a six-week online summer math program, combines content created by Rolf and his team with live discussions. Participating students connect with other students enrolled in the program and undergraduate coaches to discuss the content, quizzes, problem sets, and life at Yale to better prepare for their arrival on-campus. Rolf worked with the Center for Teaching and Learning, the Office of Undergraduate Admissions, and the Yale College Dean’s Office to develop the online bridge program to help students successfully transition to the rigors of Yale’s undergraduate curriculum. In the summer of 2016, the program worked with 109 incoming undergraduates and 24 undergraduate mentors. The first two cohorts of students focused solely on mathematics, but the program was expanded last year with a piloted version for an introductory physics course. This pilot included students completing their first year of study at Yale and prepared them before they started Physics 170 in the fall. Rolf has flipped his classroom with online videos that provide students with a basic understanding of the material prior to class. He confirms their understanding via online quizzes and then extends their understanding in class by working with the students to complete more difficult problem sets. Data shows that 64% of students think this approach is helpful to their learning and students in the flipped version of Math 115 have a better experience in later math courses. In an effort to partner with other institutions to improve STEM education, Yale shared ONEXYS assets, including videos, quizzes, and math-in-context applications, with the University of Notre Dame and Carleton College last summer. According to Rolf, this will allow Yale to not only support the larger academic community but to also learn from partners as they adopt Yale’s approach and make it better. This will ultimately improve the Yale ONEXYS experience. Learn more about Math 115, ONEXYS, and the Center for Teaching and Learning online.